You will have the thrill of a lifetime time as you cruise off 7 different zipping platforms with limited vision of what's below and in front of you. Are you afraid of the dark? 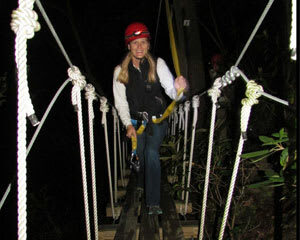 Well you will find out quickly on this unique night-time zip line tour through the shadowy forests in the dark of night. You will have the thrill of a lifetime time as you cruise off 7 different zipping platforms with limited vision of what's below and in front of you. With the light of the moon beaming down, the gentle sound of swaying tree tops and the sound of crunching leaves and branches in the distance, to say this zip tour is thrilling would be an understatement. This tour is something that must be experienced to truly understand how unique the feeling is when out in the West Virginia woods zipping high above the ground with the breeze against your face at night. No need to be scared though as you will be lead by a local expert guide who will make sure your experience is safe and fun for all.